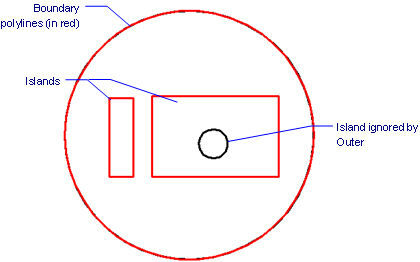 Creates a polyline that forms a boundary around closed areas, through a dialog box. Notice that BricsCAD highlights draws the boundary, allowing you to preview it. The prompt repeats, allowing you to choose additional areas, entities, or undo the selection. When done selecting areas, press Enter return to the dialog box. The prompt repeats, allowing you to choose additional entities. When done selecting entities, press Enter to return to the dialog box. 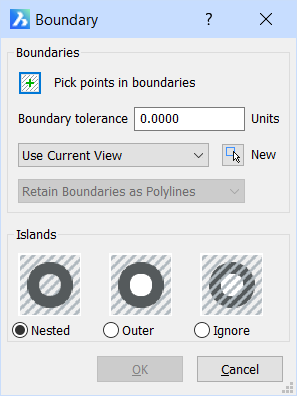 Specifies how to handle the boundary entity; currently, the only option is to make the boundary out of a polyline, and then retain the boundary after you exit the dialog box. Determines how the boundary search algorithm treats "islands", boundaries that are found inside the boundary. Select the boundary. Notice that it has many grips. Drag a grip to stretch the boundary. BHatch and Hatch - place boundaries and hatch patterns through a dialog box. -BHatch and -Hatch - places boundaries and hatch patterns through the command bar. 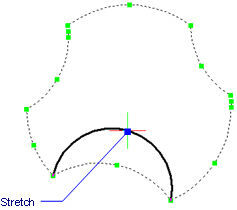 -Boundary creates a polyline boundary inside closed areas through the command bar. GenerateBoundary - Creates closed polylines from faces of 3D solids as well as the boundaries detected when the Enable Boundary Detection open of SELECTIONMODES is activated. Region - creates boundary-like regions.